Watermelon is definitely my very favorite summer fruit! Sometimes, when it’s real hot and humid here in the south, I will eat a big bowl of watermelon for supper! 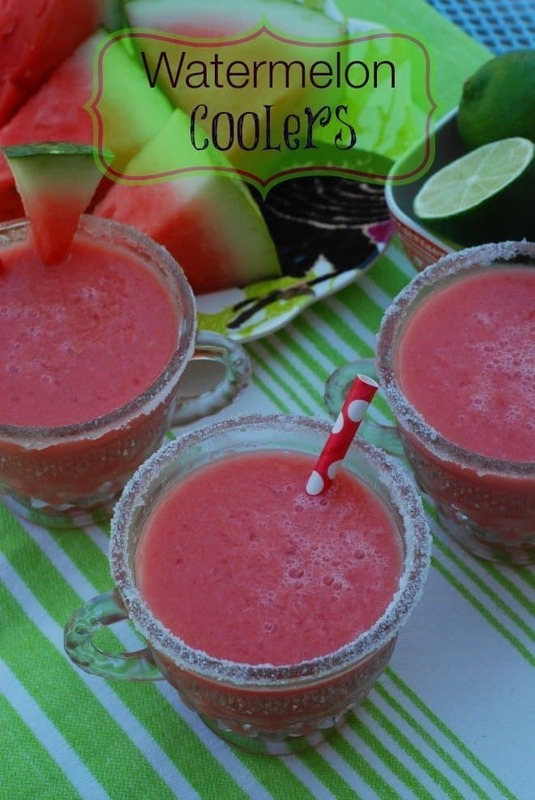 When I found a recipe for Watermelon Coolers, I had to try it! I’ve been fortunate enough to live near two different towns in the south that claim to be the watermelon capitol of the world – Cordele, GA and Pageland, SC. All I know is that I’ve had some of the best tasting watermelons from both towns! 1. It must be seedless. When I was a little girl, I always got tired of spitting out the seeds or eating around them. And we all know that if we swallow a watermelon seed, a watermelon vine will grow inside us! 2. It can’t be fuzzy! At least, that’s the word I’ve always used for watermelon that is overripe and has that, well, fuzzy taste. Gross! The watermelon should be heavy for its size. Vitamin A is important for optimal eye health and boosts immunity by enhancing the infection-fighting actions of white blood cells called lymphocytes. Vitamin C can help to bolster the immune system’s defenses against infections and viruses and can protect a body from harmful free radicals that can accelerate aging and conditions such as cataracts. A two-cup serving of watermelon is also a source of potassium*, a mineral necessary for water balance and found inside of every cell. People with low potassium levels can experience muscle cramps. Now that you know far more than you ever wanted to about watermelon, let’s move on to this week’s hit or miss. I found the watermelon coolers on Pinterest and I knew I had to try the recipe. The watermelon cooler on Pinterest contains lime juice, coconut milk, ice cubes, watermelon cubes and rum. I left out the rum. It’s also rimmed in sugar, which gives it the sweeter taste that it needs. For the pictures, I did rim them in sugar, but for my personal drink, I just added a little Splenda. Were the watermelon coolers a hit or miss? I give it 5 stars – a perfect score – because it was a big, fat hit! 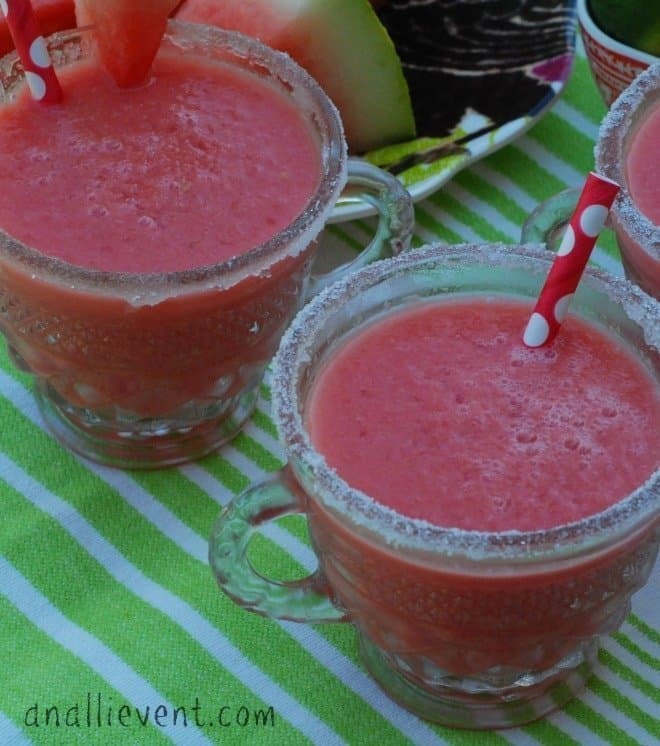 It’s a nice cold, refreshing drink with hints of coconut and lime intermingled with my favorite fruit, watermelon! 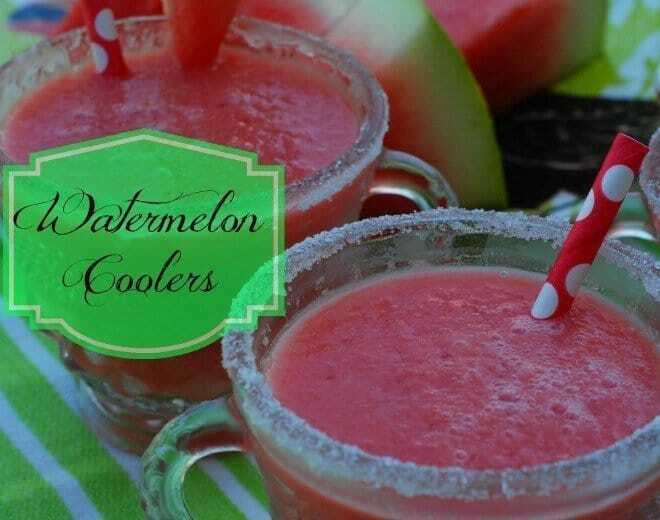 Rim glasses with granulated sugar and garnish with a lime wedge or small watermelon slice. Oh, yeah, did you know that you should wash a watermelon before slicing it? I would say these would be a huge hit! I can’t wait to make them! You lost me at coconut. Lol What could I use in the place of coconut milk? I love Hit or Miss Day ! 🙂 Alli, I am so addicted to watermelon, I could easily eat an entire one all by myself! I usually cut a whole melon into cubes, pack the cubes into Mason jars and keep them in the fridge so we can nibble all week. These coolers look perfect and I’m totally trying these! Thanks for sharing and also, I didn’t know you were supposed to wash the melon before slicing! Good tips! Have a great Wednesday! yummy, I am definitely going to pin this one. ooooh, thank you for the watermelon choosing tips! I’ve been needing those! Those coolers look yummy! Looks mighty yummy! I have watermelon in my fridge right now, was planning on making a watermelon beverage this week anyway! We have purchased several already this year 🙂 Pinning! yum!! these look truely refreshing. I can’t wait to try this! It was very good and refreshing, Emily! I thought I was the only person who described an over ripe watermelon as “fuzzy”. I am pinning this recipe. We have watermelons in our garden this year and I can’t wait to make these. Oh I’m so happy you tried this! I saw a pin too and was wondering if it was any good! Btw I know exactly that fuzzy feeling you are talking about and I can’t STAND IT! I LOVE watermelon, and these look delicious! I will definitely be trying them soon! Big Hit with the watermelon coolers! I would love some now! Pinning for later. Those are so perfect for summer! I don’t like watermelon myself, but I think I’m the only person I know who doesn’t! HA! I know lots of people who would love these! Kristen from The Road to Domestication recently posted…Pinterest Project Presented! I can’t get enough of watermelon. But everyone has different taste buds, right? Do you like any other melon? LOL @ the vine growing inside… yes I remember that tale. I love watermelon flavored things and this would be the perfect treat. I wonder if I could make it a bit creamer with Greek Yogurt instead of the coconut water. I’m sure you could use yogurt instead of coconut milk. If you do, let me know how it turns out. Omgeee! These look absolutely divine! I love how you skinny’d them up. I can’t wait to make them! It look so refreshing. I’m definitely going to have to try to recreate these myself. krystalskitsch recently posted…Have a #BetterBreakfast With TysonÂ® Day Startsâ¢ Sandwiches! They were a big hit at my house! Looks yummy! I love watermelon – did not know it offered so much health benefits. I do suffer with muscle spasms and believe I may have low potassium. Maybe I should eat more watermelon! Must must must try these! I’m a watermelon nut!